Bored To Death: "The Alanon"
Well, that was much better. First, a bit of bad news: While I still see tremendous potential in the inclusion of Zach Galifianakis and Ted Danson in the plot, I just don't think the show has figured out yet how to best use them—and not only that, but the scenes of not using them well still take up a bulk of the episode. Much like the pilot, Galifianakis was strangely reigned in, playing his distraught character as a quiet introspective guy who only occasionally manages to throw something witty into the fold. Danson, again much like the pilot, spends a good deal of time throwing around lofty ideas about human nature that feel out-of-place with the otherwise dry and plot-driven episode. He also demonstrates, simply, that he's a self-centered person, calling Jonathan over to his house so he can bruise his herpes-scorched lip so people think he got in a fight. Bottom line, both these actors need more screen time; specifically, they need to be worked into the main storyline, and fast. Because, let me tell you, it worked wonders for Jonathan's ex-girlfriend Suzanne. Like the pilot, "The Alanon" starts by showing a snapshot of the relationship's end: Jonathan calls Suzanne to his favorite coffeeshop so he can hand over a box of love letters she left at his place (ugh). Then we're whisked away to the gritty, dark confines of a bar, where Jonathan is meeting with his next client—a woman (Kristen Wiig) who fears her boyfriend is cheating on her. It's a nice contrast to the sunny coffeeshop and colonic office, also an odd focal point of this episode, and the sudden change in lighting/tone gives us a clearer sense of the kind of borrowed noir Jonathan is channeling with this new business. The story picks up from here, but unlike episode one—in which Jonathan runs into the mystery man only at the end—Jonathan is given lots of opportunities to interact, directly and indirectly, with the guy he's tailing. And this means the show finally gives us a chance to see the kind of "detective" we're going to be seeing for the rest of the season: He follows (clumsily) this guy Gary around the drug store, trying in vain to make sense of the things he's buying (metamucil and XL condoms); he follows him to the gym, and proceeds to force conversation about hot ladies and whether or not Gary's cheated with anyone at the gym; he tracks Gary to an Alanon meeting, asks one of the people waiting to get in for a nearby bar recommendation (he admits it's a pretty insensitive question); then, finally, follows Gary and Suzanne, also at the Alanon meeting, to a diner where they're holding hands. After so much covert tracking—which, it turns out, Gary realized wasn't so covert—Jonathan blows up, and things get really personal really quickly. 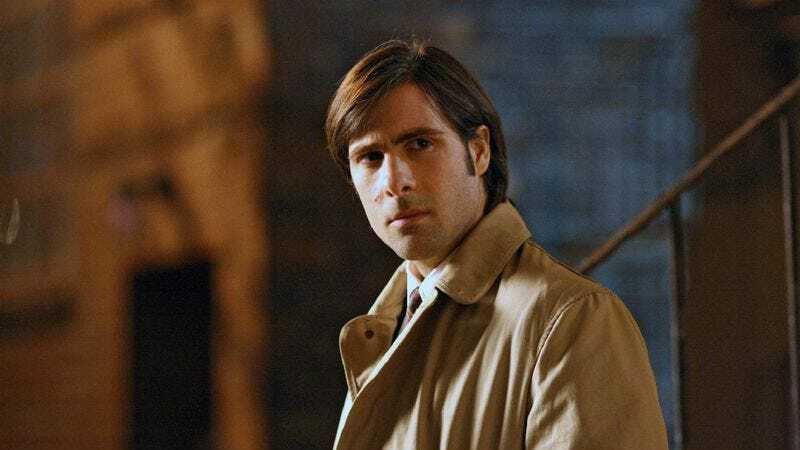 His freak-out is not only entertaining, but demonstrates that calm, collected Jason Schwartzman works only in small doses. We need something else to balance it out. And if simply sticking Suzanne into the main plot could do such wonders this week, just think what'll happen once Danson and Galifianakis are in the fold—which, hopefully, isn't that far off. "What, am I surrounded by Holocaust deniers?" Looking forward to more disturbing Ray art, as well. Hey, Ames: Any particular white wine preference?